After my last post, wherein I stated that only men sent me thermal images of their hives, I received the following images, all from women of course. But it turns out that IR (infrared) photography is more than pretty pictures; it can be a real asset for hive maintenance. Once again, I present the photos in the order they were received, and the tale just gets curiouser and curiouser. Come follow the glow. The first photo was from Debbe Krape, a beekeeper from Delaware who never fails to send me fascinating links and beekeeping stories. But Debbe’s email reminded me how often the English language trips me up. My first thought was, “Where does this go? With the men or with the women?” Not that it matters, but it was a wake-up moment for me when I realized that what I wrote and what I meant were two different things. Flir image of winter hive submitted by Debbe Krape. The photo shows a colony of bees that has migrated to the top of the hive after eating its way through the lower food supply. And look at the temperature below the cluster. Cold! 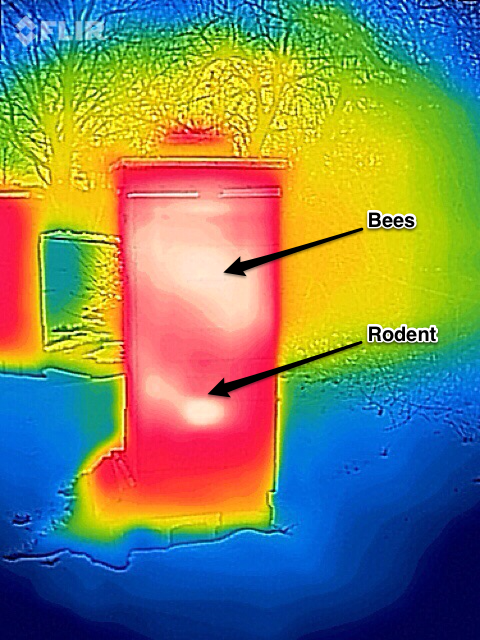 Once we got a really hard freeze going in January I was able to get thermal images of all my hives. 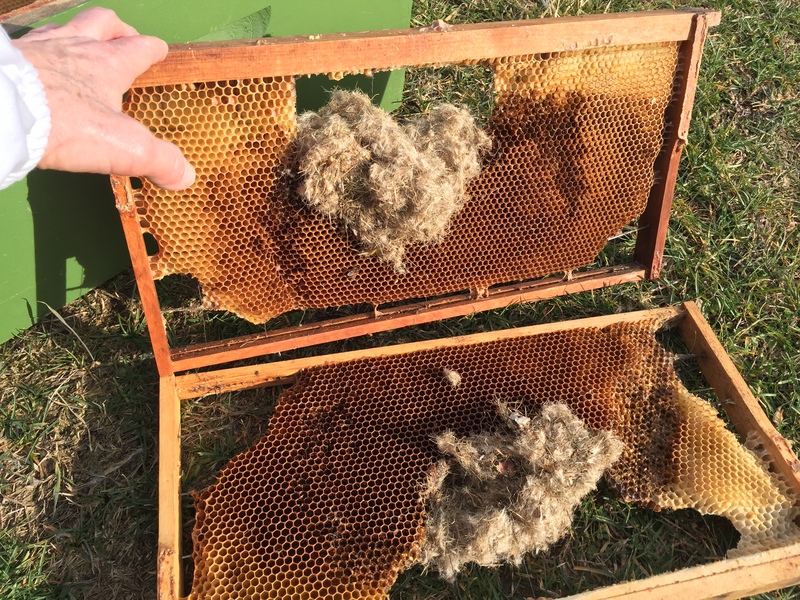 One in particular puzzled me; two distinct clusters seemed to be co-existing in one hive. It eventually dawned on me that the smaller heat-generating source near the bottom could be a mouse or shrew. Not long after we had one of those freakishly warm days, so I sent a few puffs of smoke into the entrance and soon two mice slithered out (while the bees buzzed in and out!). It was warm enough to break down the hive, replace 3 fouled frames, flip the bottom board and secure the entrance, leaving the colony rodent-free. So for me the value of the camera goes beyond ascertaining whether the bees are alive and their exact location. Here is one of the thermal images showing the mouse presence…I have had both mouse and shrew problems in the past, so wasn’t sure which type of rodent might be the squatter. Also included a shot of the (thankfully limited) damage done by those meeces. The rest of the deep was chock full of honey and pollen, so I replaced the ruined frames and moved the box to the top of the hive. A mouse in the house! 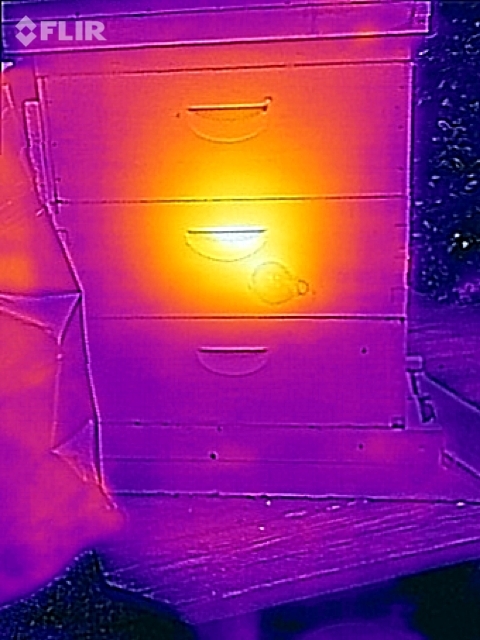 Judith was alerted by this thermal image that her hive contained squatters. On the first warm day, she was able to destroy the nest. © Judith Stanton. Mouse nest in winter hive. © Judith Stanton. Is that awesome or what? If that’s not an excuse for thermal imaging, I don’t know what is. That one image may have saved an entire colony. Well done, Judith! Special thanks to Debbe Krape, Jenny McComb, and Judith Stanton for sharing their photos and stories. I’ve thought the exact same thing. It would be nice to know where the cluster is before opening up. I am still investing my limited resources on bees, supplies and equipment. As resources lighten up, I have a thermal imager on my list to acquire. I’m thinking about it too. 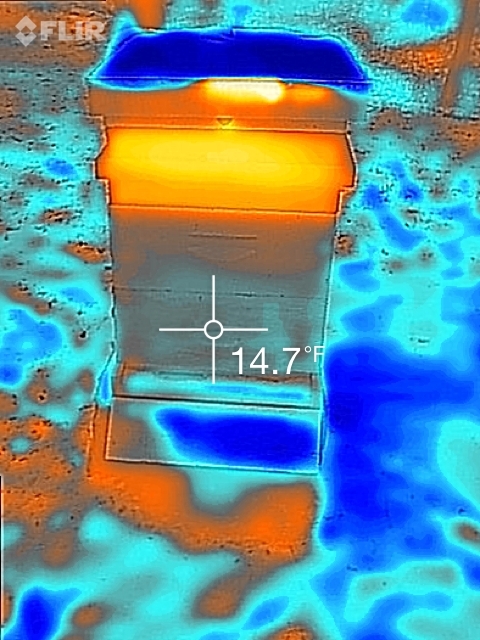 Is there a preferred product to take a picture of hives using thermal imaging? The FLIR ONE Thermal Imager for iOS is the one most people seem to be using. Just found this a couple of minutes ago on a Google search. You can rent and FLIR camera from Home Depot at their tool rental center. Don’t have the specifics yet, but this might be a cost effective way for me to use a higher end camera without having to chunk out $1000. Interesting. I will have to check into prices. But note that to purchase a Flir for iPhone is about $250, not $1000 for one that will do the job. Oh yes I realize that. I was just thinking that perhaps a device that was built up from the floor as a thermal imaging camera might produce better results than a add on to a phone? I don’t really know, but I thought it might be a fun way to test out what $1,000 cameras without actually having a buy one and then I could compare it to the quality of a add on to my android phone. Okay, yes I see your point. One more reason why technology is helping us be better beekeepers! I saw the link to the thermal imaging cameras on Amazon. Many are quite pricey but I noticed that there are android add-ons that sell for less. Would the android version work for a honey bee hobbyist (i.e., I am not a beekeeper for commercial purposes ((selling honey, etc)))? I think the Android version will work, but I don’t know of any beekeepers using them. Maybe someone will let us know. Just got off the phone with a Home Depot rental center in San Jose, CA (couldn’t find any near my home in San Francisco, other than Rohnert Park). How addictive is beekeeping that I am coveting the mouse/shrew nesting material from Judith’s hive? I need some to line a bumble bee nesting box. That’s so funny! She would probably share. I actually collected bird nests, the soft kind made from moss and downy feathers, to use for that purpose. When the birds were done, of course. Would you comment on the usefulness of a mineral oil fogger on mites. How often and how good a job it does. I got a new package of bees coming. I lost my bees this last winter and I want to (B) more careful this time. I don’t know much about it, except for this post written by my friend Maggie who used it in New Zealand. Could you ask your friend Debbe Krape what type of Flir camera was used on that shot–in other words, was it the add-on to the phone (version 1 or 2) or a stand-alone? The quality on that one is nicer than the others that state Flir One (phone add-on). Debbe? Can you answer this?